STAND: The Student-Led Movement to End Mass Atrocities welcomes yesterday’s introduction of H.R. 5273, The Global Fragility and Violence Reduction Act of 2018 by Representatives Eliot Engel (D-NY), Ted Poe (R-TX), Mike McCaul (R-TX), Adam Smith (D-WA), Bill Keating (D-MA), and Paul Cook (R-CA) in the United States House of Representatives. Today, the world is facing the worst humanitarian crisis since World War II, the highest number of refugees in recorded human history, and a 25-year peak in violence conflict. In the last 15 years, half of the world’s population has been exposed to political violence. The human toll is devastating, and a reevaluation of U.S. strategies for preventing and responding to such violence is long overdue. There is also a huge economic cost to violent conflict. According to the Institute for Economics and Peace, the economic impact of violence on the global economy in 2014 was $14.3 trillion – or 13.4% of the world’s GDP. Additionally, 91% of global donor funds are spent on conflict response, and only 9% on actually addressing violence and its causes. Clearly, a new approach is needed to stop violence at its core – and that’s exactly what the Global Fragility and Violence Reduction Act intends to do. This historic legislation establishes an interagency Global Initiative to Reduce Fragility and Violence, which will develop strategies for reducing violence in ten pilot countries. 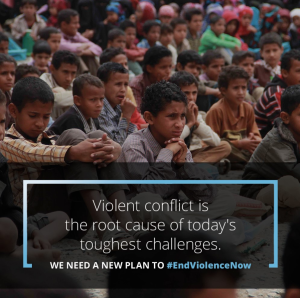 Importantly, the framework prioritizes continuous evaluation and assessment of efforts in each country in order to better evaluate U.S. efforts to address the root causes of violence and conflict, and will provide the administration the guidance, funds, and flexibility needed to better prevent and respond to violence around the world. STAND, as the student-led movement to end mass atrocities, is proud to join with 34 other organizations in supporting the Global Fragility and Violence Reduction Act. Visit www.allianceforpeacebuilding.org/violencereductionbill to learn more about this initiative.